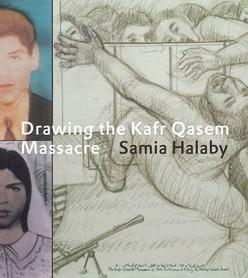 Samia Halaby’s recently released book, Drawing the Kafr Qasem Massacre (Schilt Publishing, 2017) has been shortlisted for the prestigious Palestine Book Awards, an annual event that recognises English language publications on the subject of Palestine. Halaby’s book was selected from more than forty entries, and is listed among other books by renowned writers and scholars such as Ilan Pappe and Ella Shohat. The winners of the award will be announced on 24 November in London. An evening with the shortlisted authors will be held at P21 Gallery the day before.